In an interview with BT, Quoted from Daily Mail, Chelsea manager Jose Mourinho claims the club will not sell popular defender David Luiz, whatever big-money offer Barcelona make. The versatile Brazil star, 26, had been linked with a shock exit, but Mourinho is adamant the player is in his Stamford Bridge plans. Mourinho said: ‘No chance he is going to leave. He is a player we want to keep. He is a player with four years (on his) contract, he just signed a contract last year. ‘I don’t know if he said that. What I can say is that he is not going to. It has been just days ago that David Luiz who was in training with his national team mates preparing for a game against Switzerland when asked about the possibility of joining FC Barcelona. David Luiz said that he will only concentrate on his national team while he is there and refused to answer any questions asked of him by the media about a departure from Stamford Bridge. The versatile Brazilian Center back signed a 4 year extension to his contract last summer to take his contract until 2017. He joined us from Benifica for 21.5m pounds on a transfer deadline day in January 2011 and has since become a huge fan favorite with Chelsea fans. So, it will be on the best interest of the fans and every one involved that he stays with Chelsea. Mourinho also gave his words that Luiz is surely an important part of his plans for the upcoming season in West London. 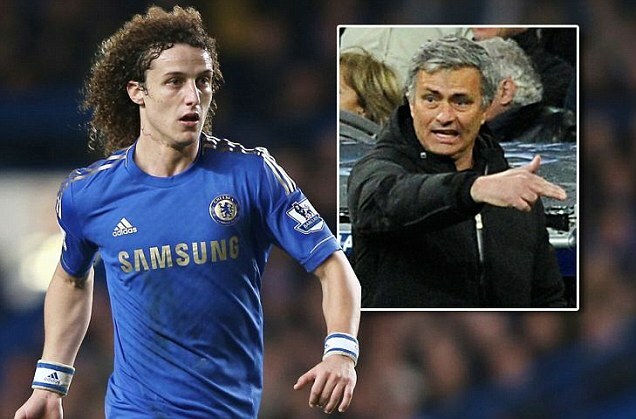 What do you think of Jose’s comments about Luiz and whether the Brazilian will stay or not? Leave your comments and let us know your opinions! KTBFFH!!! How difficult is it to say “I love Chelsea and M not gng anywhere” ?!! I have to agree with the valid points you make in your aclirte because I see things like you. Additionally, your content is interesting and really good reading material. Thank you for sharing your talent.